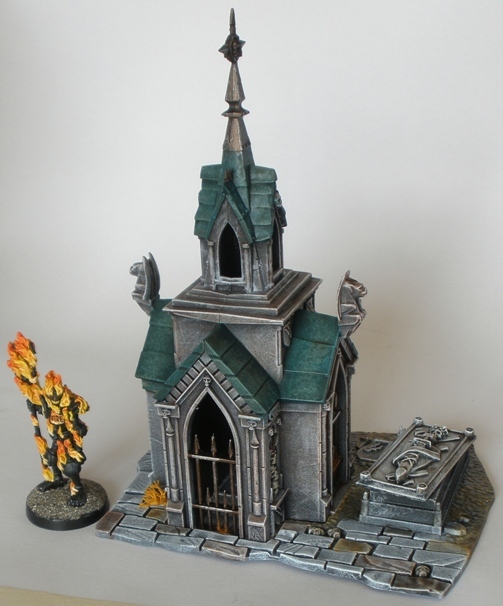 Following on from Mondays WiP post here are some close up shots of some of the finished graveyard elements. I wanted to avoid green plants. Therefore I went with rusty red on the undergrowth to get the terrain to fit in with the rest of my wastelands stuff which in turn matches the bits of lichen that I attached here and there. I am particularly pleased with how the mausoleum roofs worked out. I am also happy with the three crows that feature throughout the piece. By using a different technique to the last time that I tried to paint black birds they came out much better. Its a very minor thing, but satisfying for me. Sometimes it really is the little things. The large skull-faced gates (one of two shown) are both magnetised so they can be removed as and when required for game purposes. I considered leaving the gates permanently open, but adding the magnets was more fun. I went for a walk around a local overgrown graveyard and took some photos in preparation for painting this stuff. As It happened I simply went for the easy, more theatrical approach to painting the pieces rather than trying to duplicate complicated patterns of wear and plant growth on the pieces. The end result is more Scooby Doo than some might like. Visiting the old graveyard turned out to be interesting in itself anyway, even if it had little influence on how the models finally turned out. Since I finished these I have dug up a few more bits that will be getting painted up to go with this set, but for now I have plenty to game with. 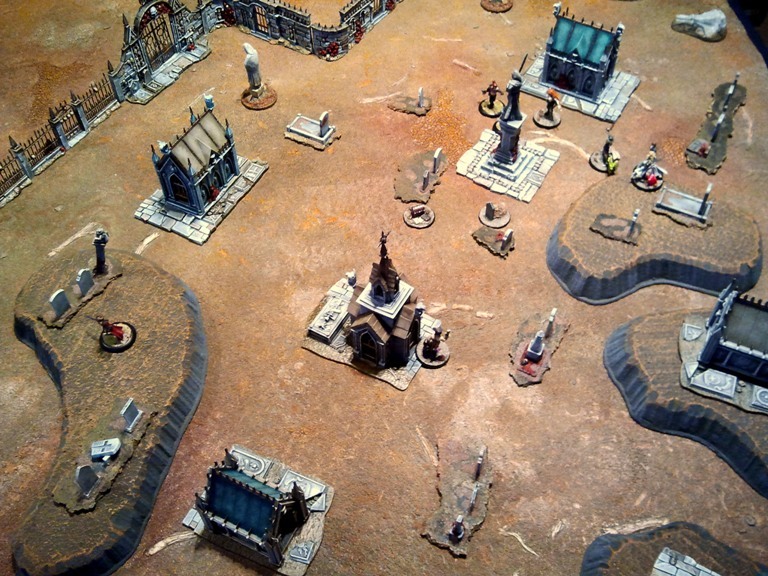 In fact I played a game with COM on the brand new graveyard terrain within hours of finishing it, which was satisfying. Any chance we could see a pic of the gates whilst open? Hi Tadhg. I will see what I can manage regarding a photo of the open gate, but it may not be what you are expecting. It is worth bearing in mind that I didnt make the gates functional via the magnets: they dont swing open and shut. What I did was glue the left and right hand gates together, clip the small hinge pieces off each side and attach a magnet to the centre bottom of the gate with a corresponding magnet attached to the base. The single gate piece can therefore be removed in its entirety to show that it is “open” if required. 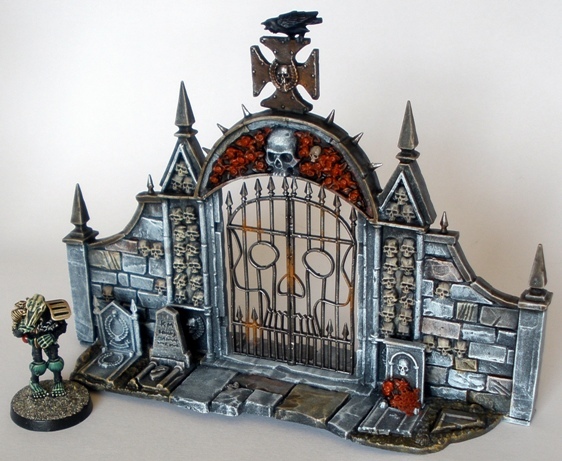 I considered making the gate operational but it would have been fragile, harder to store and a little impractical for my tastes. 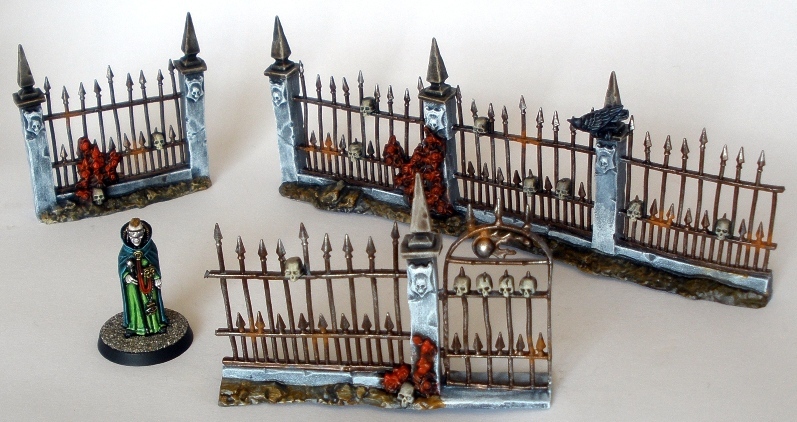 The compromise approach that I took allows use of the goofy but fun gate pieces without them being too delicate for gaming with. If you take a close look at the first photo in the post you can see the recesses in the wall for the now absent hinge pieces on the gate. The magnet attached to the bottom of the gate piece itself is also visible as its a bit larger than the bars of the gate around it. Thanks for your interest, I hope that the above was clear. Ah, I see! I took your meaning up wrong so. I was very impressed that you made them functional whilst keeping the structure sound, but what you’ve said makes much more sense. It doesn’t take away from my view of your work though. Great job altogether.The roofs are particularly impressive. While it wouldnt be exceptionally difficult to magnetise the gates on two axes so that they could rest in both open and shut positions, I figured that it wasnt worth the exra effort. 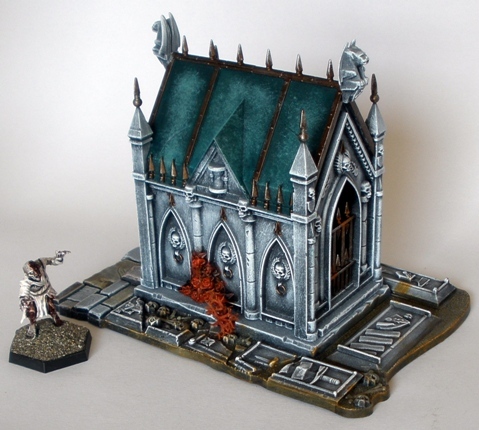 That definitely looks awesome, the mausoleum roofs especially. Great job! Your wasteland terrain is getting to be quite the setup. I am trying to loosely stick to a palette with the wasteland terrain (better late than never), a bit like I would with any coherent group of miniatures. As such I wanted to exclude green from the graveyard generally. I didnt use any greens when tinting the individual blocks for example, which is something that I would definitely have done for a less arid looking terrain set. I still couldnt stop myself from painting the coppery green roofs though, as that greenish turquoise vaguely verdigris colour is lovely. I do have a lot of wasteland terrain at this stage, which is pretty cool. I still have to work on a a few more shanty town elements but once they are done it will be as close to finished as it will ever be. I have plans for sci-fi city terrain after that, but I am getting ahead of myself: shanty/post-apoc cow town next. 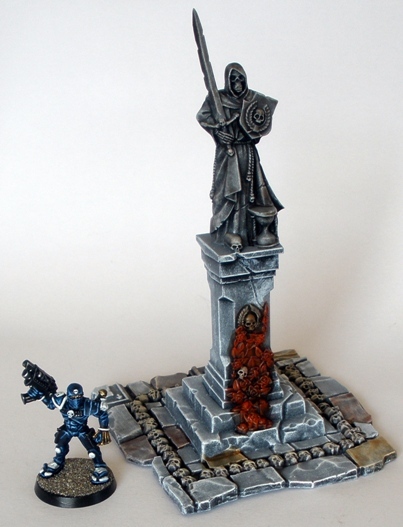 Really beautiful terrain pieces, and your painting is always an inspiration! Your use of blue/green/turquoise makes the terrain eye-catching without looking out of place. 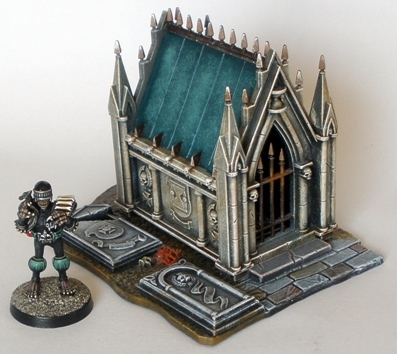 I washed a couple of the mausoleum/crypt pieces with ink so that the stone areas would not be too uniform/monochrome. It always feels a bit risky when using a colour as lurid as that old GW turquoise ink in that sort of context, but I think that I got away with it. As I mentioned in the post, I dont really tend to paint anything in terribly realistic colours and I dont really know if I could. I dont hate the comic book, Hanna-Barbera sort of finish that I get, but for a while I thought that I may have gone too far on the mausoleum with the turquoise stonework. Wow, GW’s sculptors really do get paid by the skull, don’t they? Initially I didnt care about the GW skulls, then it started to bug me, now I generally just find it funny, except when it spoils something nice. 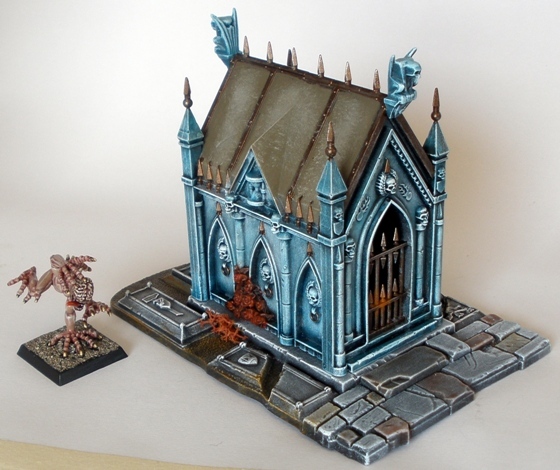 GW make a quite cool observatory piece of terrain that I would like to have, but the surface below the observatory dome is covered in three metre (in scale) gigantic stone skulls. Sheesh. Thanks Mattias. I imagine that your latest LPL entry would look well staggering around a Stillburgian version of same. very nice work! that turqoise roof-color looks delicious! The turquoise roofs are the best elements of the graveyard for sure. They were easy to paint but turned out to be the most evocative elements. Yea, it makes a really good contrast with the reds 🙂 I really like how you painted the stones as well, very nice colors. I especially like that the stones on the ground are different colors and not a monotone grey, really makes the pieces come alive. As there were a large number of graveyard pieces to finish I needed to make sure that I had a rapid technique to shade and highlight the majority of the pieces. Anything too fussy and I would likely run out of steam before I finished the project. To that end everything was brought up from black undercoat through grey spray highlights up to a drybrushed white. On top of that I tinted various areas (like the stonework) with inks and thinned paints. Some areas (such as the the roofs) got painted with opaque colours as normal. That step simultaneously made the stone elements more realistic (colour variation) and less realistic (it looks a quite cartoony, like the backgrounds in an old Disney movie or something). Overall I am satisfied that it is more pleasing to the eye this way, at the expense of realism. Thank you for the insight, I rather like a bit of a cartoony feel though 🙂 I’m much of a bright colors painter myself, because like you say, I personally find such pieces more interesting to look at. If you favour a cartoony style then you will probably like the trees that I prepped for the graveyard over the last week. The GW plastic woods have a very Tim Burton/Sleepy Hollow/Brothers Grimm look to them, rather than looking like model railroad trees or similar. I should have photos of the trees up here soon. These look outstanding! Very inspirational! I got a real World of Warcraft vibe from it – specifically Raven Hill Cemetery in Duskwood. I was always tossing up on whether to get one of these kits, and I think now I’ll be purchasing two of them and probably trying (badly) to emulate the exact look you’ve applied so well to the models. Thanks Azazel. I have never been a PC gamer and I tend not to see fantasy stuff that doesnt have a “science” prefix, so WoW is pretty much an unknown to me. I am acutely aware of the damage that video games can cause to toy soldier plans though, be strong. 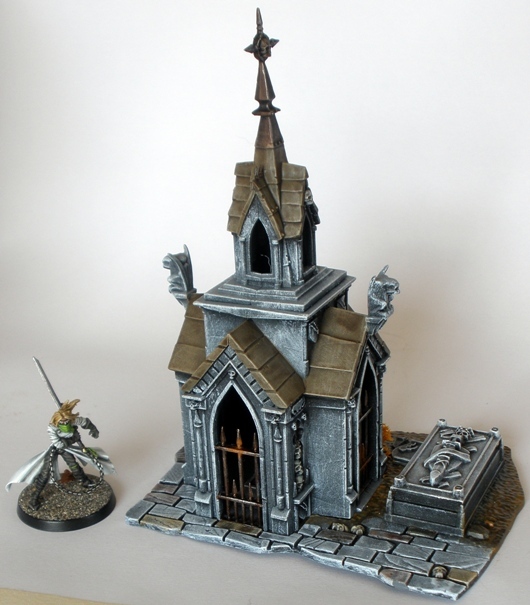 The WiP post linked to at the top of this page runs through the simple techniques that I used to get the graveyards painted quickly. It was very straightforward, well within your comfort zone I would think. The Garden of Morr is a fantastic kit. It is really very quick and easy to assemble, its great. I thoroughly recommend it.